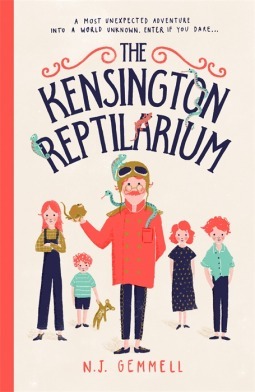 I have to admit that I was drawn to this book by the cover artwork which depicts four cute kids and a rather quirkyly dressed man entwined with reptiles. Even the spine is beautifully embossed with a snakeskin design. Set in December 1945, the Kensington Reptilarium tells the tale of four kids from the Australian outback. With their mother passed away and their father missing in action, they are moved to London, which has been devastated by war. Uncle Basti is their new guardian and he resides in the Kensington Reptilarium - a fantastical building filled with mysterious secret rooms and reptiles of all descriptions. Unfortunately for the kids, their uncle is a social recluse who doesn't like children and the local police are trying to shut the Reptilarium down. This story has strong themes of family, World War II and the construction of gender and would therefore be most suitable for upper primary students over 10 years of age. I found the portrayal of Australia and the way the children lived in the early chapters reminiscent of the Lost Boys in Peter Pan. The language used throughout the book is very lively and colloquial with frequent use of mannerisms. The sentences are often short and sharp with the pronoun omitted to emphasise thought processes and maintain a fast pace. Excerpts could readily be used to model this style of writing. The author also makes great use of devices such as onomatopoeia and gives beautiful poetic descriptions such as "ghost gums like shinbones" which are used to great effect (p36). Teachers notes and ideas for classes are available from Random House.